Artie Kaplan is a saxophonist and flutist that has played on over 150 Top Ten records. In the 70s he was an in-demand session saxophone player working with artists like Barry Manilow, Carole King, Brook Benton, etc. He's also the saxophonist on huge 70s hits "Sunny" by Bobby Hebb and "Locomotion" by Little Eva. 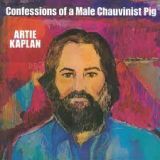 His 1972 album "Confessions Of A Male Chauvinist Pig" became a best seller in Europe. The lp contains two hits, "Harmony" and "Bensonhurst Blues". "Harmony" worked its way to becoming a huge hit for Kaplan in Italy, France, Germany and Spain, while "Bensonhurst Blues" as well as being a hit for Kaplan, has been discovered by Dutch recording artist Oscar Benton to become a great success all over the continent as well as the title song in the hit movie "Pour la peau d'un flic" directed by Alan Delon. This Product was added to our catalogue on Monday 28 May, 2012.